By the age of 26 Krzysztof Penderecki had already received three awards from the Polish Composers Association for his works Strofy, Psalmy Dawida and Emanacje. This success, as well as the premiere performance of these works at the "Warsaw Autumn" and in Donaueschingen, quickly brought Penderecki international fame. Through his Saint Luke Passion, for which he was awarded the Kunstpreis from North Rhine-Westphalia and the Prix Italia, he achieved rare popularity among contemporary avant-garde composers. Anne-Sophie Mutter on Krzysztof Penderecki and his "Metamorphoses": The great polish composer Krzysztof Penderecki is, in the complexity of his musical development, equal to Picasso. Few composers have demonstrated so many different sides and, at the same time so many contradictions. I met and learned to admire Penderecki at the beginning of the eighties. I found his Polish Requiem, which was written at this time, particularly moving. 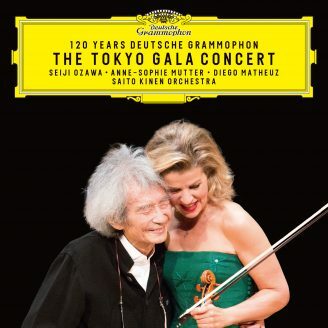 Now I feel extremely fortunate and privileged to be able to introduce a violin concerto from him to the world. Penderecki himself says that, which is new, can only be effective and known in context with that which is old. His ability to render new notes again and again is exemplified in his Second Violin Concerto. The Metamorphoses require my best technical skills and yet give me with tremendous musical fulfillment. One of the greatest musical highlights for me is the last slow segment, which picks up the pounding theme of the first segment. It concludes with a burial scene, in which the soul departs the dead body and ascends toward heaven. For me, this work is a physical and psychological challenge, which I often accept with tremendous gratitude.